In large saucepan cook green beans in boiling lightly salted water for 10 minutes or just until tender; drain and rinse with cold water. Set aside. In extra-large bowl combine vinegar, tomato juice, oil, wine, sugar, Worcestershire, mustard and garlic. Stir in beans, green onion, and carrot. Refrigerate, covered, 4 to 48 hours. Serve with a slotted spoon. Makes 12 (about 1-cup) servings. Assemble and refrigerate 4 to 48 hours. The fresh green beans will lose some color as they marinate in the dressing. 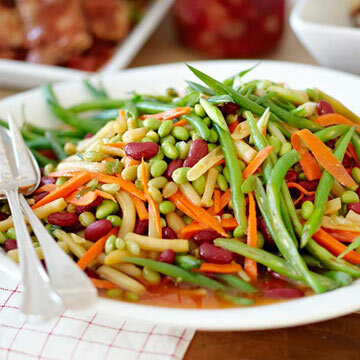 For brightly colored green beans cook and chill as directed, but do not add to salad. Cover and refrigerate separately, then toss in with the salad just before serving.